Responding to the Disaster: an educational hub summit on November 3rd! 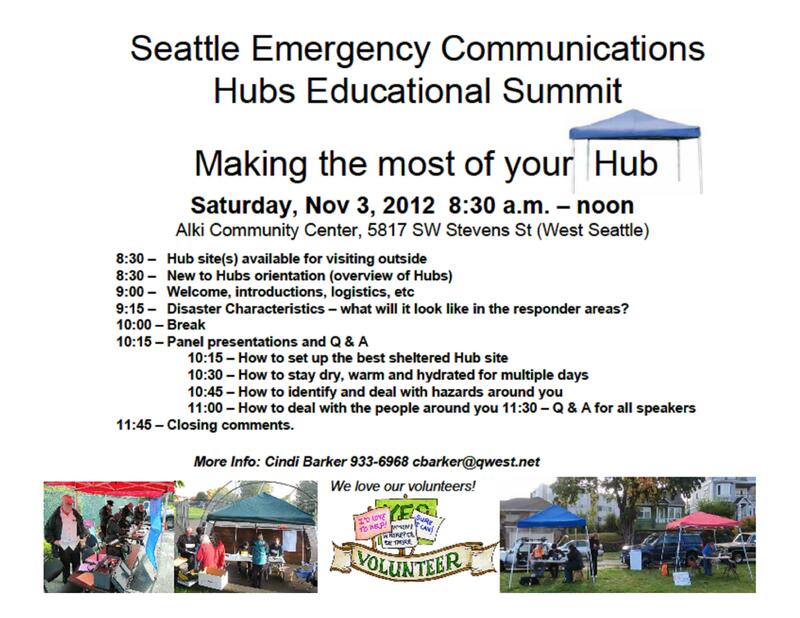 Join us for an educational summit about the Seattle Emergency Communication Hubs! This citywide event will be held here in West Seattle at the Alki Community Center (5817 SW Stevens Street, Seattle 98116) on Saturday, November 3rd from 8:30 AM until noon. Do you know that there are Emergency Communication Hubs throughout Seattle (map), as well as in other neighborhoods throughout West Seattle? Do you have questions about how the hubs will operate? Do you want to see how a hub is set up? If so, plan to attend the hub orientation session or visit the demo hub. We have some great panelists and guest speakers! Learn how to identify and deal with hazards around you; how to deal with the people around you (who may be injured or in panic mode); and most importantly, learn how to stay dry, warm and hydrated for multiple days. Additional details are in the flyer below. Everyone is welcome. We hope to see you there! Responding to the Disaster – educational emergency communication hub summit on November 3rd! This entry was posted in Announcements, Earthquake Preparedness, Events, West Seattle Be Prepared and tagged announcements, earthquake preparedness, West Seattle Emergency Communication Hubs, West Seattle emergency preparedness. Bookmark the permalink.